The Sacrament of Marriage unites two people in a covenant with God and themselves for a lifetime of dedication and well-being to each other, their children and the community. It is a public sign that they have given themselves to one another. It is the first Sacrament that was instituted by God. Marriage is a sacrament that takes time for preparation. We want couples to be well-prepared. St. Michael Catholic Church offers marriage preparation to help couples develop a better understanding of the sacrament; to evaluate and deepen their readiness to live married life; and to gain insights into themselves as individuals and as a couple. Couples who are contemplating marriage at St. Michael Catholic Church should contact the Parish 12 months before your anticipated wedding date to begin sacramental preparation for marriage. The classes are $50 per couple. Contact: Deacon Harry Heinz at 817.510.2737 or Click Here to Email. The marriage preparation requirements are set by Diocesan Policy. At least one of the parties should be a practicing Catholic and a member of St. Michael parish. Baptismal Certificate a copy of your baptismal certificate from the church of Baptism dated within six months of the date presented to St. Michael. A letter of Good Standing (if the Presider is from outside the Diocese of Fort Worth a letter from his bishop or religious superior), and permission from the pastor of St. Michael if the Presider is from another parish within the Diocese of Fort Worth. Already married? Become a marriage sponsor couple! Click here for more information. 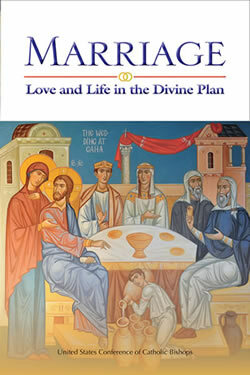 The Sacrament of Marriage between two Catholics ideally takes place during a Eucharistic Celebration; those being married are the ministers of Christ’s grace and mutually confer the Sacrament upon each other by expressing their consent in the presence of the Church’s minister and those in attendance. The Sacrament of Marriage between a Catholic and non-Catholic is normally celebrated at a Liturgy of the word. We are excited to celebrate this Sacrament with you and hope you consider our sacred space for your upcoming wedding. Here's a great website for planning your Catholic Wedding. Click the image below. Scheduling your wedding date is subject to the availability of the church and clergy of St. Michael and should not be set prior to beginning your marriage preparation. The wedding date is tentatively set when the couple begins marriage preparation and is subject to the Marriage Tribunal for the Diocese of Fort Worth approving the finalized wedding preparation packet.